The Yanmar 4LHA-STP marine diesel engine rethinks the straight-six. Electronic engine management on the Yanmar 4LHA-STP marine diesel reduces exhaust emissions. However, a mechanical engine is easier to repair in remote areas. 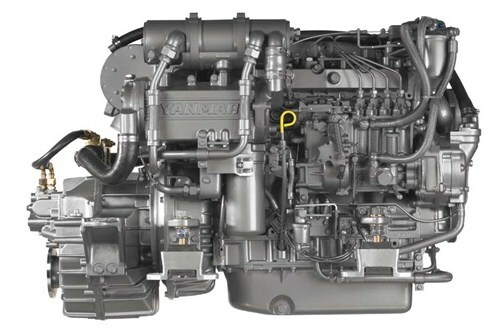 The Yanmar 4LHA-STP marine diesel engine is the biggest four-cylinder diesel in the Yanmar engines recreational inboard range. It’s the most powerful of a trio of marine diesel engines from 158 to 237bhp that suit semi-displacement cruisers up to 11m as singles, and up to 13m as twins. Like other large-displacement fours such as the Beta 90, the direct-injection 4LHA range has mechanical fuel-injection and scores its power increase through turbocharging and intercooling. The mechanical aspect makes sense since there are many old farts like me out there who prefer this type of engine control. Sure, electronic engine management reduces exhaust emissions and allows for real-time fuel flow and range-to-empty meters but in remote areas a mechanical engine is easier to repair than an electronic unit. This is why mechanically injected engines from John Deere are popular in long-range trawler yachts. But these are heavy, achieve maximum output at much lower revs and are intended for full displacement hulls, not semi-displacement cruisers. Compared to Yanmar’s 311bhp 6LPA-STP2 marine diesel, originating from the Toyota Land Cruiser 4.2-litre straight six, the 4LHA-STP was specifically designed as a marine engine. Yanmar didn’t opt for a belt-driven overhead camshaft as with the six and stayed with two valves per cylinder instead of four. Way simpler when it comes to checking valve clearances. For its output the STP is a fairly high-revving engine, though not as high as the six. Sensibly, the piston stroke isn’t much greater than the cylinder bore so piston speeds won’t be excessive. And Yanmar has kept a reliable OHV design with gear-driven pushrods plus a cast-iron cylinder block and head, even though freshwater (heat exchanger) cooling is standard. Just as well since few owners would want the drag of keel cooling pipes in a semi-displacement hull. A high-mounted and voltage-regulated 80-amp alternator is standard but this is bit light for powering comprehensive on-board electronics. The 2kW starter motor is mounted above the engine bearers and away from bilge water, though a well-maintained boat should never have more than a puddle in the bilge. Yanmar offers two hydraulic multi-disc clutch gearboxes for the STP, both having eight-degree down angles at the output flange. The Kanzaki ’box has reduction ratios from 1.67:1 to 2.43:1 ahead and astern, while the ZF63A ratios are 1.21:1 to 2.53:1. It’s a pity that neither has a deeper astern ratio than ahead as with Yanmar’s mechanical sailboat ’boxes but the power output relative to hull displacement in a semi-displacement boat is way higher than a yacht where good stopping power is essential. Complete with Kanzaki ’box, the STP is 1131mm long, 719mm wide and 811mm high, so there’s minimal encroachment on accommodation space relative to output, particularly compared to a six. The 6LPA-STP2 engine is 1257mm long, though at 451kg with ’box it’s not much heavier. The belt-driven camshaft does save weight. Yanmar recommends specific diesel engine sump oil at SAE 15W40 for all ambient temperatures and I’d suggest changing the oil and filter every 100 running hours or annually. Like all mechanically injected diesels, the STP should not be run continuously below its maximum torque band or excessive injection advance could glaze the cylinder bores through unburned fuel. Mechanically injected diesels must be worked to maintain a long service life. As the maximum torque band is from 2400-2600rpm the STP should not be run continuously below 2200rpm. Yanmar states the maximum continuous rpm is 3100 but I’d recommend running at this rpm in calm water only and 2900 to 3000rpm would be better for maximum continuous operation. Power Equipment, the national Yanmar distributor, provides examples of the STP fitted to actual boats. A Fairway 36 cruises at 12kt and 2400rpm and runs out to 18kt at wide-open throttle, whereas twin STP engines cruise a 13-metre Millcraft cat at 16kt, with WOT achieving 22kt. Millcraft states that 2.48:1 gear reductions are used while swinging four-bladed 22 x 22.9in props. Whatever type of hull the STP is fitted in, the fact it’s a Yanmar will improve resale value when it’s time to upgrade or repower. It’s not a marinised automotive engine nor does it have a combined cylinder block and head as with one of the direct competition. In my opinion that design is plain stupid – how are the bores accessed should re-honing and oversize pistons be needed? Just remember that as the STP is a big four, it needs flexible engine mounts and coupling to reduce harmonic vibration through the hull structure. Don’t expect it to tick over smoothly at lower rpm! Like what you see? Why not subscribe to Trade-a-Boat magazine today?